Christmas is a time for giving, but unless you’re incredibly lucky, chances are you’ll have at least one gift that you don’t like – or can’t even stand the sight of. You can repurpose them, re-gift them, even sell online, but if you run out of ideas think about donating them to charity. Too many chocolates, cookies, unwanted Christmas hampers? Donate to the People’s Food Bank. Run by local charity St. James’ Settlement they provide temporary food assistance to the poor. For a list of the food donations accepted and their collection points, please follow this link. They accept: Clothing, shoes, handbags, books and household linens. The Salvation Army is one of the most established organisations for recycling goods. Donated goods are sorted, distributed and sold in Family Stores in Hong Kong and Macau. The net proceeds will go to The Salvation Army for use across its invaluable community programmes. Some of the donated goods will be directly helping people in need, such as home alone elderly, street sleepers, ex-prisoners and CSSA recipients. Donations can be dropped off at one of their many Family Stores, a list of which is provided on their website. Friends of the Earth launched the Used Clothes Recycling Program in 2001, which collects all sorts of textile products: used clothes, shoes, bed sheets and handbags. Re-wearables are exported to neighbouring countries while the worn out pieces are turned into wipers for industrial use. They have over 200 collection points – check out their website and find the one closest to you. If the amount of used clothes exceeds a certain number (e.g. 5 large bags of clothing or more), Friends of the Earth would arrange door-to-door collection service. Please notify them 1-2 weeks before in advance. Please call 2528-5588 for further details. One of the oldest charitable institutions in Hong Kong, the Po Leung Kuk was founded in 1878 to rescue women and children from human trafficking. In it’s long history, Po Leung Kuk is best known as an orphanage, today it offers a wide range of social services in Hong Kong including adoption, integrated family services, elderly services, medical and integrated health services, education and much more. 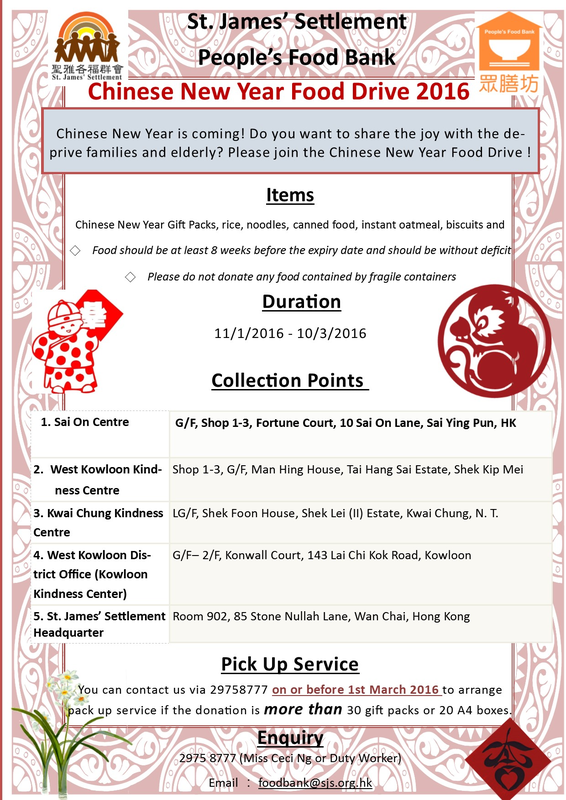 Po Leung Kuk welcomes donations-in-kind to fulfil the basic needs of their service recipients, particularly children, the elderly and low-income families! All kinds of items are welcome – electrical appliances, computers, stationeries, toys, books, household accessories, cookware, etc. For any enquiries, please email plkinfo@poleungkuk.org.hk or contact their Corporate Communications Department on 2277 8352 (Corporate Donation) / Social Services Department on 2277 8158 (Individual Donation). So get rid of the unwanted clutter, donate, help our community and save our environment through recycling. Every day, 3,400 tonnes of food waste are sent to landfills in Hong Kong, while one million people live in poverty struggling to afford nutritious meals. 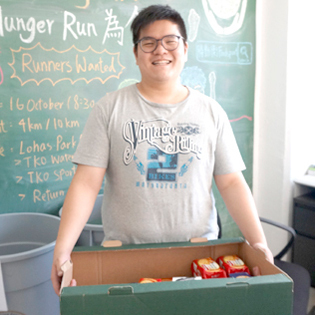 Feeding Hong Kong bridges this gap by linking food companies and charities to redistribute surplus food from where it is plentiful, to where there is a need. quality surplus food from the food industry that would otherwise go to waste. food to charities feeding those in need. with volunteers to collect, sort and deliver food. with community partners to raise awareness and make positive change in society. Warehouse Session : Organise a group to help sort and pack food in their warehouse. The Bread Run : Volunteer as Bread Runners and help collect surplus bread. Food Drive : Host a food drive to collect food donations for those in need. Meet & Greet : Visit their warehouse to learn about food banks. 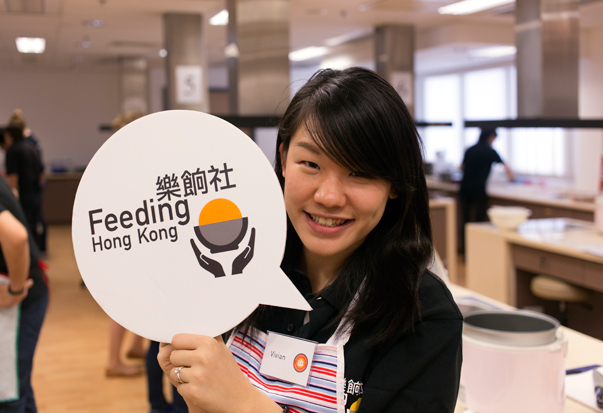 Founded in 2001, Foodlink Foundation is a registered Hong Kong charity dedicated to fighting hunger, building self-sufficiency, and fostering nutritional wellness among those in need, while simultaneously reducing food wastage in hotels and F&B outlets in Hong Kong. The vision at Foodlink Foundation is to ensure that every needy person has access to a hot, healthy meal, every single day. Foodlink acts as a bridge — a charity dedicated to connecting the supply directly to the demand, as often as possible, by collecting safe-to-eat surplus food from F&B outlets all over the city and deliver to those in need. The benefits are twofold — while reducing hunger Foodlink also reduces the pressure on the city’s landfills. Every 20 kg of your surplus food gives eight families of four, or 32 people, a hot, nourishing meal. If your organization has food surplus and an ambition to help the community, then healthy, nutritious food is what Foodlink needs. Chinese New Year is a time of year for celebration and gift giving. In the Chinese tradition, food is generally given as gifts as part of the new year’s celebrations. If you have received one gift too many, think about making a donation to Food-Co and the People’s Food Bank. 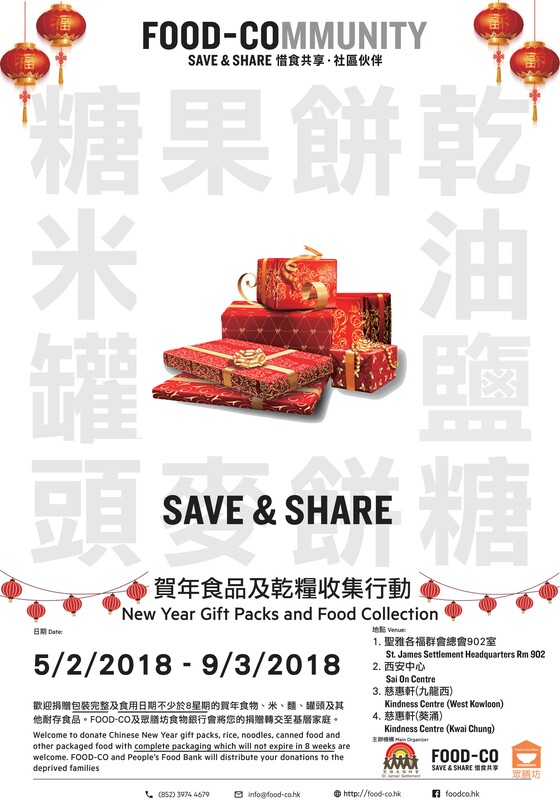 In this holiday season, they are looking for Chinese New Year gift packs, rice, noodles, canned food and other packaged food with complete packaging with an expiry of 8 weeks or longer. 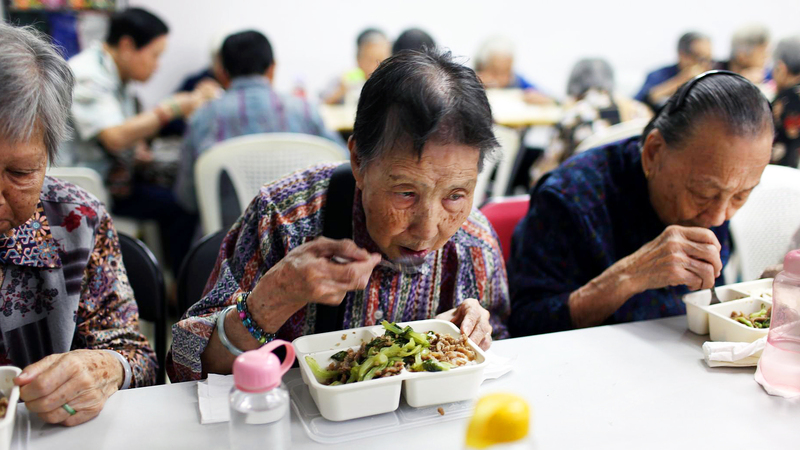 Around 970,000 Hong Kong people live below the poverty line. FOOD-CO and People’s Food Bank will distribute your donations to the deprived families. Support this food drive and support deprived families in Hong Kong. About Food-Co: In June 2016, St. James’ Settlement was awarded by SIE Fund to run FOOD-CO the first IT platform for food support service. FOOD-CO aims at facilitating food donation in a more efficient way with advancement in technology and data analysis. FOOD-CO works with like-minded partners to solicit resources for poverty alleviation. They cultivate a culture of save and share, with an aim to reducing food waste and creating a better living environment. 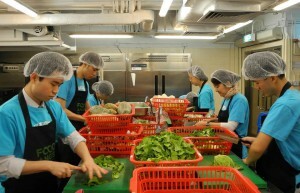 About People’s Food Bank: The office of the People’s Food Bank is located at Sai On Centre, Sai Ying Pun. It was originally a relief centre for street sleepers. It went into operation on 24 March 1997 and is still providing services for street sleepers on Hong Kong Island today. All along, the centre has been providing food for street sleepers and emergency food supplies for the poor to relieve their hunger. After the financial crisis of 1998, the issue of poverty worsened in Hong Kong. A UN report on human development pointed out that in terms of the gap between the rich and the poor, Hong Kong ranked number 3 in developed areas of the whole world and number 1 in developed areas of Asia. The SAR Government reduced CSSA for the first time in June 1999. This caused further hardship to those who relied on the SAR Government for their livelihood. With the economic downturn and high rate of unemployment, the number of street sleepers shot up. The number of referrals to this centre for food assistance continued to increase. In November 2002, with the help of Food Link, the centre obtained leftovers from a hotel. The food collected, combined with vegetables, provided food for the stomachs of 12 people on average every day. In 2003 when Sars was ravaging the territory, the hotel stopped the supply of food. The free food service offered by the centre was temporarily suspended. Fortunately, a donation made by a Mr Li meant that the service could be relaunched. The daily quota for meal service increased from 12 to 24. Thereafter, the number of people asking for food assistance kept on increasing. As a result, St. James’ Settlement formally established the People’s Food Bank on 13 December 2003, providing the poor with temporary free food assistance. 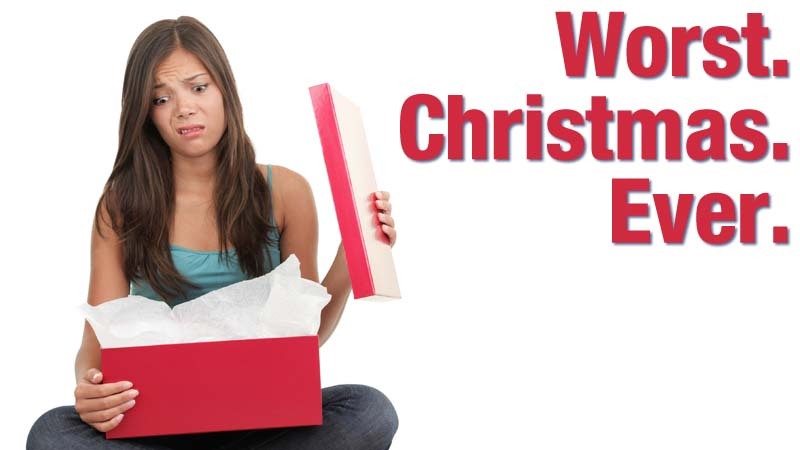 Christmas is a time for giving, but unless you’re incredibly lucky (or sent out a specific list of desired items before), chances are you’ll have at least one gift that you don’t like –or can’t even stand the sight of. You can repurpose them, re-gift them, even sell online, but if you run out of ideas think about donating them to charity. Food Angel is a food rescue and food assistance program launched in 2011 by Bo Charity Foundation with the mission of “WASTE NOT, HUNGER NOT.” The program rescues edible surplus food from different sectors of the food industry that would otherwise be disposed of as waste. 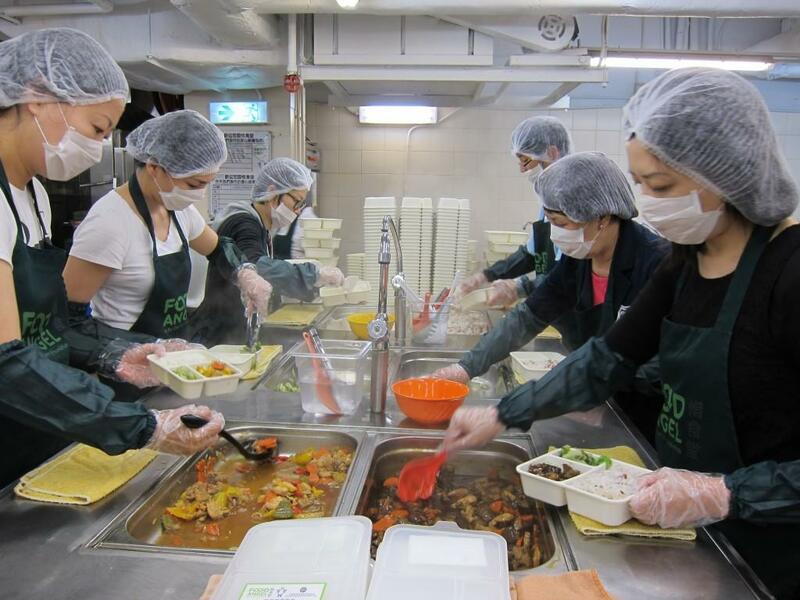 Following strict safety protocols, the rescued food items will then be prepared as nutritious hot meals in their central kitchen and be redistributed to serve the underprivileged communities in Hong Kong. 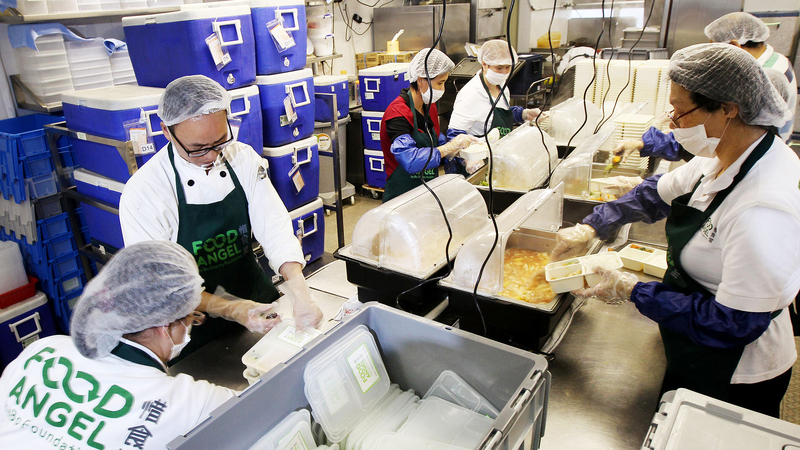 Until March 2011, Food Angel has provided over 2,956,453 meals and rescued over 2,474,823 kg of surplus food from going to the landfills. Beneficiaries of Food Angel include deprived elderly (71%), children from low income families (20%), the unemployed (3%), disabled and people in rehabilitation (4%) and the homeless, caged home dwellers etc (2%). To volunteer, you need to be over 16. You can volunteer as an individual or in a group. To find out about available dates and to register, please follow this link. Too many food gifts from relatives? Donate to People’s Food Bank! Chinese New Year is a time of gift giving, especially food gifts to relatives. Do you have a lot of food gifts received from relatives and friends left over after Lunar New Year Holidays? You can share the joy and blessing with the underprivileged families by donating your CNY gifts to the People’s Food Bank. Please Act Now! 5. Kwai Chung Kindness Centre, LG/F, Shek Foon House, Shek Lei(II) Estate, Kwai Chung ,N.T. About the People’s Food Bank: The office of the People’s Food Bank is located at Sai On Centre, Sai Ying Pun. It was originally a relief centre for street sleepers. It went into operation on 24 March 1997 and is still providing services for street sleepers on Hong Kong Island today. All along, the centre has been providing food for street sleepers and emergency food supplies for the poor to relieve their hunger. After the financial crisis of 1998, the issue of poverty worsened in Hong Kong. A UN report on human development pointed out that in terms of the gap between the rich and the poor, Hong Kong ranked number 3 in developed areas of the whole world and number 1 in developed areas of Asia. The SAR Government reduced the Comprehensive Social Security Assistance (CSSA) for the first time in June 1999. This caused further hardship to those who relied on the SAR Government for their livelihood. With the economic downturn and high rate of unemployment, the number of street sleepers shot up. The number of referrals to this centre for food assistance continued to increase. In November 2002, with the help of Food Link, the centre obtained leftovers from a hotel. The food collected, combined with vegetables, provided food for the stomachs of 12 people on average every day. In 2003 when SARS was ravaging the territory, the hotel stopped the supply of food. The free food service offered by the centre was temporarily suspended. Fortunately, a donation made by a Mr Li meant that the service could be relaunched. The daily quota for meal service increased from 12 to 24. Thereafter, the number of people asking for food assistance kept on increasing. As a result, St. James’ Settlement formally established the People’s Food Bank on 13 December 2003, providing the poor with temporary free food assistance. The People’s Food Bank only receives a small amount of subsidies from the SAR Government. Most of the food, money, tools and equipment are donated by benefactors. The People’s Food Bank main task is the collection of food and monetary donations. Their partner agencies in various districts in turn deliver the food to the poor. Their Mission: The People’s Food Bank’s mission is to provide food to people in need on a short-term and weekly basis, relieve hunger and to promote social cohesion through encouraging people to share resources with those less fortunate than themselves.